Ferguson: Two police officers shot during protest. 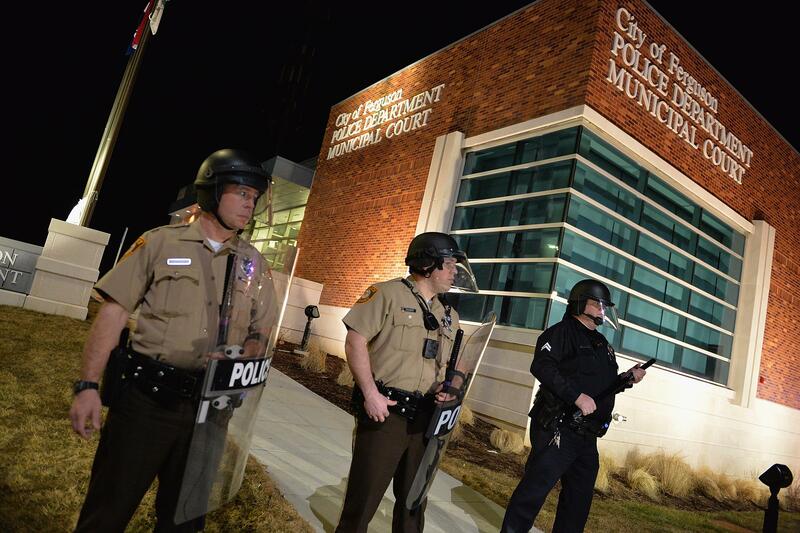 Police wear riot gear outside the Ferguson Police Department on Wednesday. Two police officers were shot in Ferguson, Missouri, early Thursday morning following a night of protests outside the city’s police department. According to the New York Times, an officer from the St. Louis County Police Department was shot in the shoulder and an officer from the town of Webster Groves was shot in the face. Their injuries are reportedly serious but not life-threatening. The shots came during a demonstration following news that Ferguson Police Chief Thomas Jackson and several other officials would resign following the release of a highly critical Department of Justice report documenting a pattern of racial discrimination in the city’s police department. Jackson and his department had been widely criticized since the shooting death of unarmed black teenager Michael Brown last summer. The shooting took place shortly after midnight following what had been a mostly peaceful protest in front of the department Wednesday night demanding more action over the report. Officers from a number of agencies had been gathered outside the building. Click here for an update on the officers’ condition, and video that captures the sound of the shooting.